His Dirkness: What do we have in Matt Cassel? The Kansas City Chiefs' starting quarterback has been everything we've been asking for over the past month. In fact, no NFL quarterback has posted a higher QB rating since the calendar page flipped to October. Matt Cassel has given us two of his best performances of his career the past two weeks to silence the critics that were growing louder by the week. All you heard the first four weeks of the season was how good the Chiefs could be if they had a good QB. Cassel has quietly put together some solid stats though, and there has never been any question about his dedication to the team or his passion to win. Tell me if this picture, combined with his recent behavior, reminds you of anyone? The feistiness. The fire. The fist pumps. The over-exuberance. The dorkiness. It could only be one man: Jake Delhomme. Look, Delhomme was not the most talented quarterback to come along, but he inspired his teammates and they believed in him. They went to battle with him because they knew how much he wanted to win. Jake the Snake came into the league under similar circumstances as Cassel (Delhomme undrafted, Cassel a 7th round pick). Delhomme didn't get his first chance to lead a team until 28 (Cassel at 26). They were both counted out and have both shown an incredible amount of heart. Delhomme, paired with a strong running game and stout defense, led his Carolina Panther team to a Super Bowl. 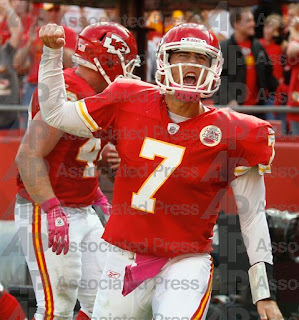 Can Matt Cassel be our Jake Delhomme? 1. Be efficient on 3rd downs. 3. Be at your best in the 4th quarter. Cassel's stats on 3rd downs: 25-47, 328 yards, 2 TD, 0 INT, 89.7 QB rating. Chiefs 3rd down conversion rate: 29-77, 37.7%, 21st in NFL. Chiefs 3rd down conversion rate (last 2 games): 15-27, 55%, would be good enough for #1 in NFL. Analysis: Cassel has shown improvement over the last two games. The third down stats are a bit skewed because of our inability to run for 3rd and short yardage (which is perplexing given our gaudy rushing game stats). This is, and will continue to be, the ultimate judgment stat on Cassel in my eyes. Cassel's fumbles: 1 fumble (you might remember this as the play he fumbled twice), 0 fumbles lost: Chiefs have fewest fumbles and fumbles lost in the NFL. Cassel's sacks: 5 sacks (fewest in the NFL!). Analysis: Cassel's worst trait coming into this year was his affinity for getting sacked. Leading the league in that category is astonishing and speaks for both Cassel and the offensive line's improvement. The lack of interceptions and fumbles is just gravy on top. I had no idea the Chiefs were that effective in these categories until I looked them up. Cassel's 4th quarter stats: 23-42, 225 yards, 1 TD, 0 INT, 78.0 QB rating. Cassel's 2nd half stats: 43-72, 586 yards, 5 TD, 0 INT, 108.9 QB rating. Cassel's stats in last 2 minutes of half: 15-25, 196 yards, 1 TD, 1 INT, 81.4 QB rating. Analysis: Cassel has been good but not great in the 4th quarter. He played mistake free in the 4th against San Diego (partial credit). He put together somewhat of a game-winning drive in the 4th quarter against Cleveland (full credit). He couldn't come up with a play against Indianapolis (full blame). The Texans game came down to a called pass play on 3rd and 2, where I'm not sure how much choice Cassel had in the matter, with the primary receiver smothered (partial blame). Jacksonville and San Francisco games were already decided. Adding it up, it's a complete wash. When throwing "Wide Left" (2010): 11-30, 143 yards, 2 TD, 2 INT, 46.9 QB rating. When throwing on 4th down (2010): 3-4, 31 yards, 1 TD, 0 INT, 136.5 QB rating. When throwing on 4th down (career): 18-24, 186 yards, 7 TD, 2 INT, 101.7 QB rating. When throwing with a lead in the game (2010): 108.0 QB rating. When throwing when behind in the game (2010): 65.9 QB rating. All 3 INT's of 2010 have happened in the 2nd quarter. Cassel actually posts his lowest QB rating on 1st down (71.9), universally considered the friendliest QB down. 1 month of greatness does not make up for 1.5 seasons of terrible performance. Getting sacked on the last play of the game is inescusable to me I don't care who you are or how you have been playing.. I only got to watch the end of the game today because we were gone, and I barely caught the last 2 minutes on Redzone. So I will have to rely on the highlight reels to see how he played the whole game. He looked pretty good on that 2 minute drill though. I was a little concerned with his last 2 passes. They just didn't look like they had a lot of zip on them, but he did connect. Hopefully for the Chiefs he is turning the corner, the Chiefs look like they could do some real damage this year if they can keep the offence going. I am however willing to give Cassel two more years. I think it may take a while for him to stop assuming he's going to get hit before he gets into a three step drop. The pressure he had to deal with last year was basically a wasted year in development if you ask me. I forgot to mention that I value intelligent quarterbacks a lot. For instance, if Cassel was ever to say he was going to take a team coming off a Superbowl win "to a new level", that would raise red flags. Luckily he has not done that yet.